Anyone who knows San Francisco well is prone to complain about San Francisco’s changing food scene. Many of the good restaurants, particularly international cuisine, have been priced out of the city altogether – mostly due to ridiculously high residential and commercial real estate costs. Even celebrity chef-turned TV star Anthony Bourdain lamented in a special about the San Francisco Bay Area that the city has “sold out” to shiny pet projects of Silicon Valley executives with too much money with which to invest. After nearly a year as a resident of the city, I have found good food throughout San Francisco, but I believe that the food scene of city itself faces stiff competition from other cities – even within the Bay Area. But a couple of San Francisco neighborhoods continue to prove that San Francisco is still worthy of its reputation as a center of cuisine: the Inner Richmond and Inner Sunset districts. What, surprised that I did not include the Mission in that group? I have yet to be impressed by that neighborhood, once the bastion of Mexican and Latin cuisine. It epitomizes everything Anthony Bourdain decried – the gentrification and Silicon Valley-ization of the city. My friends of Middle Eastern descent warned me that Arabic, Turkish, Lebanese, and other regional foods in this city are not up to East Coast standards. I have come to believe them. Yet these same friends recommend one place in the city, and that is Lavash, located on Irving Street just south of Golden Gate Park in the Inner Sunset. An unassuming storefront and elegant but cramped interior do not give much indication of the powerful flavors of Lavash’s Persian cuisine. After two visits, I’m a huge fan of this restaurant. Its meats are tender and packed with flavor, but its vegetarian dishes also are a treat for the senses. A reasonable wine and beer list are a good indication Lavash is far from ordinary, and it’s no “ethnic” dive either. If you’re unfamiliar with Persian cuisine, here’s a primer. You’ll typically start with sabzi panir, a refreshing salad heavy with fresh herbs – mint, cilantro, basil; tomatoes, walnuts; and cubes of feta-like fresh cheese. For appetizers, you won’t exactly find the mezze/meze/mezeh to which you’re accustomed in the Middle East, but instead Iran’s unique versions – such as kashj-e badamjam, a pureed eggplant salad infused with pomegranate molasses; or a thick, strained yogurt not too far from Lebanese Labneh, for instance. Saffron, yogurt, and pomegranate are prominent accents in meat and rice main dishes. Kabobs are like Persian currency. My good Assyrian-American friend pronounced that Persians are the best at tenderizing and flavoring their meats of all culinary traditions in the Middle East. Joojeh – lime, yogurt, and saffron marinated chicken skewers; shishlik (lamb chops) and barg (beef); salty koobideh – a mix of ground lamb and beef; roasted veggie kabobs: and even less traditional mahi and prawn kabobs Grace Lavash’s menu. Oh, and lavash – thin flatbread – is usually served both alongside and underneath kabobs, soaking up the meaty juices so no bit of flavor is wasted. Salads are fresh and healthy side or light main course options as well. The Shiraz salad (cucumber and tomato) is a refreshing accompaniment to the heavy dose of meat in the kabobs and other main dishes. 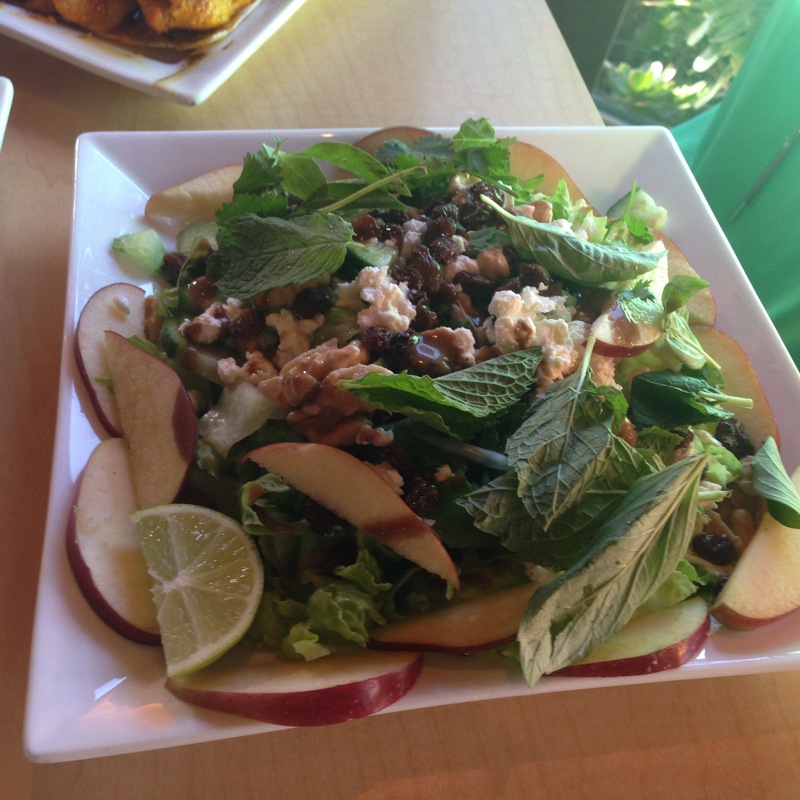 The lavash salad is more substantial, with feta, walnuts, and apple atop mixed greens. 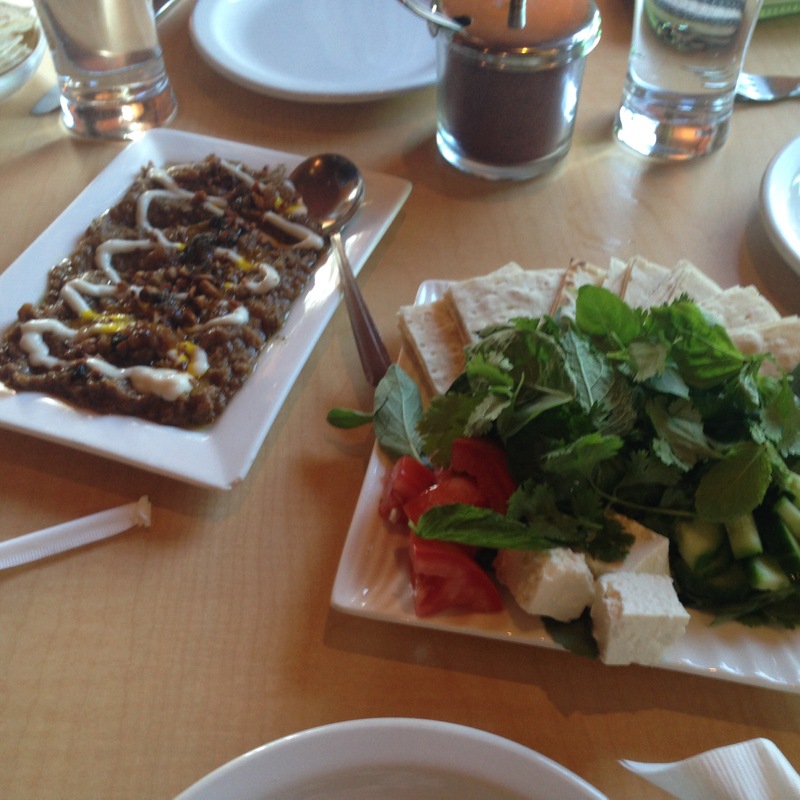 Lavash Restaurant is a wonderful ambassador of Persian cuisine. In both of my visits, every dish, every bite was memorable.